This limited edition is available only in select markets. Orders will be fulfilled on a first-come, first-served basis until inventory has sold out. Note - Stirrers pictured in the glassware are not included in this promotion. Your credit card will be charged at the time of shipping. The newest iteration of the Grey Goose Riviera bottle series - Grey Goose by Quentin Monge - is designed by renowned illustrator and native son Quentin Monge. This special limited edition bottle pays homage to the brand's French heritage while upholding Monge's signature 'slightly whimsical' take on his home region. With this limited edition summer bottle, Grey Goose recognizes that the heart of the Riviera and the art of summering can be experienced anywhere in the world with great friends and amazing cocktails. Summer isn't just a season, it's a mindset. This limited time offering includes one bottle and two signature Grey Goose acrylic glasses, making it the perfect gift for any special occasion. ©2018. GREY GOOSE, THE GEESE DEVICE AND ITS TRADE DRESS ARE TRADEMARKS. IMPORTED BY GREY GOOSE IMPORTING COMPANY, CORAL GABLES, FL. VODKA - 40 % ALC. BY VOL. DISTILLED FROM FRENCH WHEAT. This product is only available for delivery in the following states: CA, IL. Clear, fresh with an elegant floral aroma accented by a subtle citrus note. Initially soft with a gentle sweetness and light citrus. Creamy and harmonious, with a smooth rounded texture and richness of almond. Fresh and bright throughout with a long, satisfying finish. 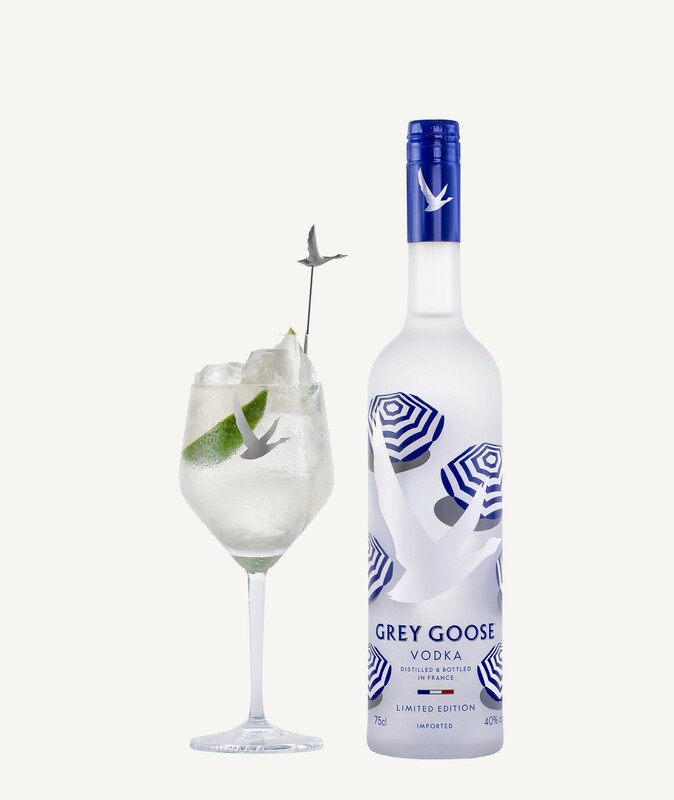 Grey Goose is the result of an absolute determination to create a vodka unlike any other. It is defined by the character and expertise of the man responsible for its creation - the dedication, innovative spirit, and the intimate understanding of Maître de Chai (Cellar Master), François Thibault. The creation of Grey Goose begins with the very best ingredients from France – soft winter wheat from the Picardie region, le grenier à blé (the breadbasket of France) and spring water from Gensac-La-Pallue in the Cognac region. This unique blend of French ingredients and a custom-calibrated, once-distilled process come together to create the World's Best Tasting Vodka. Build in an oversized cabernet wine glass with lots of ice. Add Grey Goose® Vodka and St-Germain®. Then squeeze fresh lime and discard. Stir and garnish with fresh lime wedges and a Grey Goose stirrer.